Confession is a difficult sacrament for many Catholics. It seems that the more we need it, the less we want it. And it is only natural to be uncomfortable speaking about our moral failures. Fortunately for all of us, God’s mercy is endless, and he desperately wants to forgive us our sins, and bring us closer to Him. Despite our nervousness or discomfort, God listens patiently through our Priest, and when he gives us the blessing of absolution, we are set free. The joy of that freedom, washed clean, weight lifted from our shoulders, is almost indescribable. If you haven’t been to reconciliation in a while, your Priest will help you through it. Look through the resources on this page to refresh your understanding and prepare yourself for the most amazing and fully Catholic sacrament. 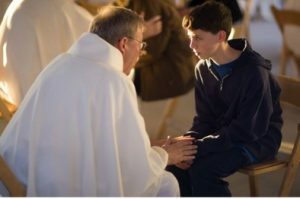 The Sacrament of Reconciliation is offered weekly as individual confessions, and periodically in communal celebrations of the sacrament (Reconciliation Schedule) or by appointment. For children entering 2nd grade or older who would like to begin preparing for First Reconciliation, contact Stacey.